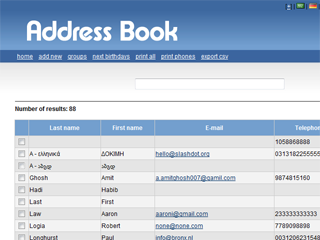 Simple, web-based address/phone book, contact manager, organizer. Groups, addresses, e-Mails, phone numbers & birthdays. vCards, Excel, iPhone, Gmail, Yahoo & Google-Maps supported. This app is in status BETA and is only available for testing to members of the Amahi Tester Program until the app is stable to become Live.